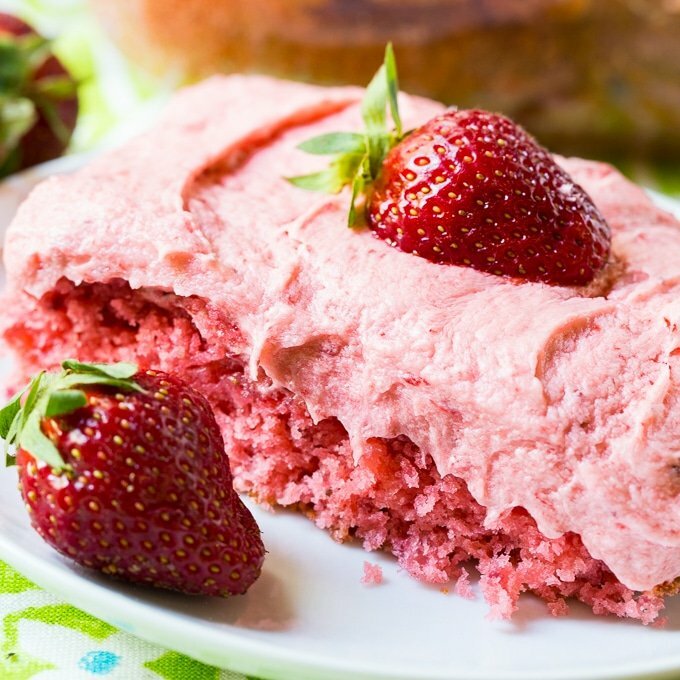 Strawberry Sheet Cake with fresh Strawberry Buttercream Frosting has so much strawberry flavor and it is a cinch to make with a box of white cake mix. The cake itself gets its strawberry flavor from fresh strawberry puree and a box of strawberry gelatin. The frosting is a creamy buttercream made with fresh strawberry puree that’s been reduced to thicken it and concentrate the flavors. We live right next to a strawberry farm so I have no excuse not to make lots and lots of fresh strawberry desserts. 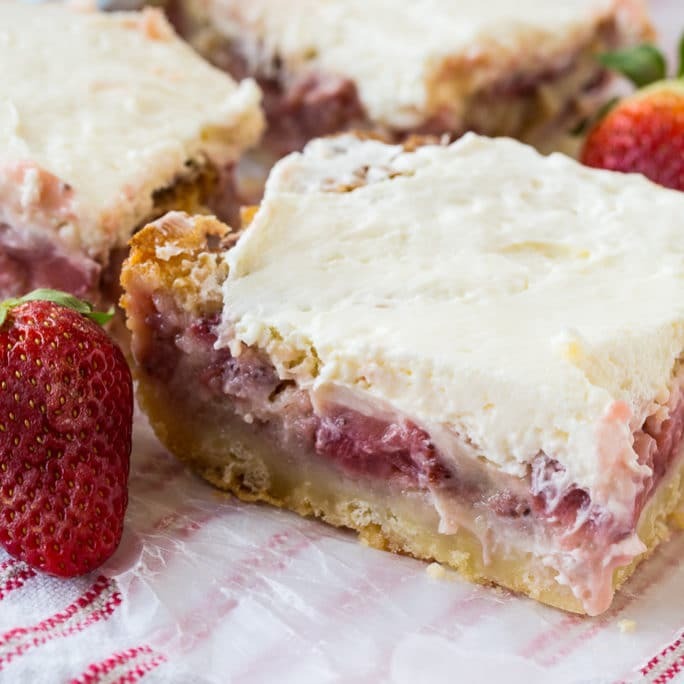 Strawberry Shortcake, Strawberry Lasagna, and Strawberry Fritters are just a few of my favorites. 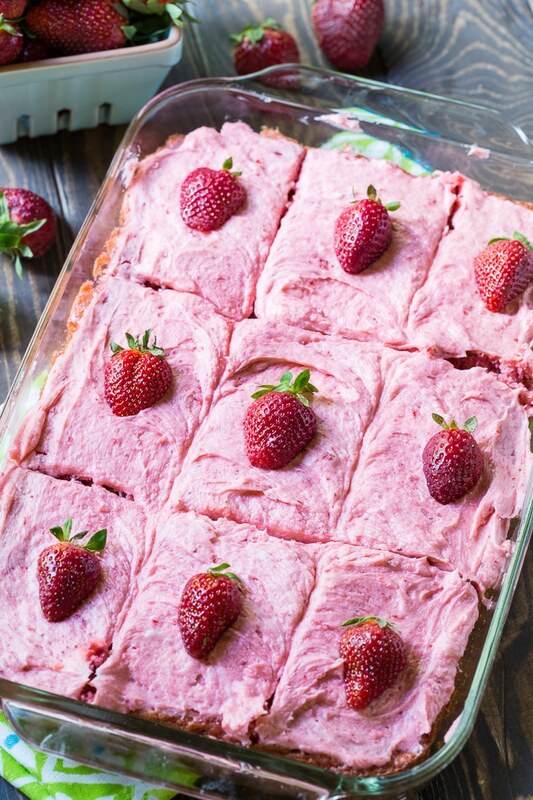 This Strawberry Sheet Cake is up there with my very favorite strawberry recipes. It’s unbelievably light, tender, and moist and absolutely bursting with strawberry flavor. It’s easy to cut into squares for a potluck or picnic. I like to decorate each slice with a strawberry half. Such a pretty spring dessert! Sharing this recipe with The Weekend Potluck. Stop by for lots of great recipe ideas! 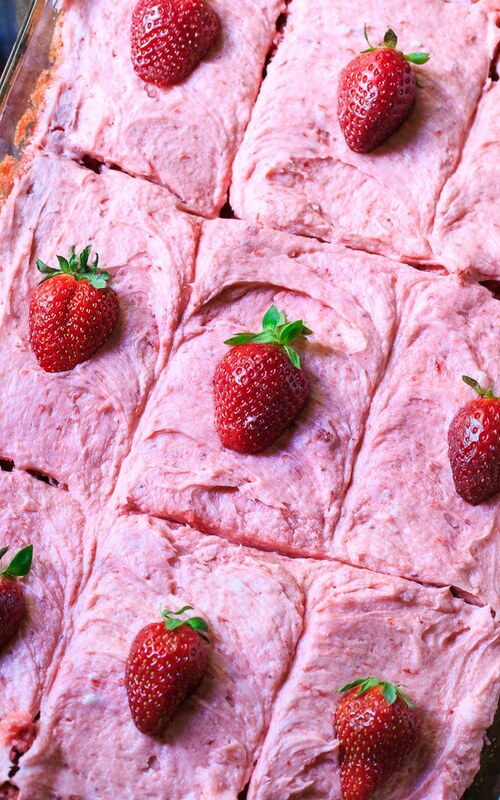 Strawberry Sheet Cake is bursting with strawberry flavor and covered in a thick layer of fresh strawberry buttercream. Lightly spray a 9x13-inch pan with cooking spray and preheat oven to 350 degrees. Place 2 cups of strawberries in a blender or food processor and process until very finely chopped. Measure out 1 cup. Add cake mix, eggs, and vegetable oil to a mixing bowl. Use a hand mixer or stand mixer to mix well. Mix in the 1 cup of strawberry puree and the (dry) strawberry gelatin. Pour batter into prepared pan and bake for 30 to 35 minutes or until a wooden pick inserted in the center comes out clean. Let cool. Make frosting. Process the remaining 2 cups strawberries in a blender or food processor until smooth. 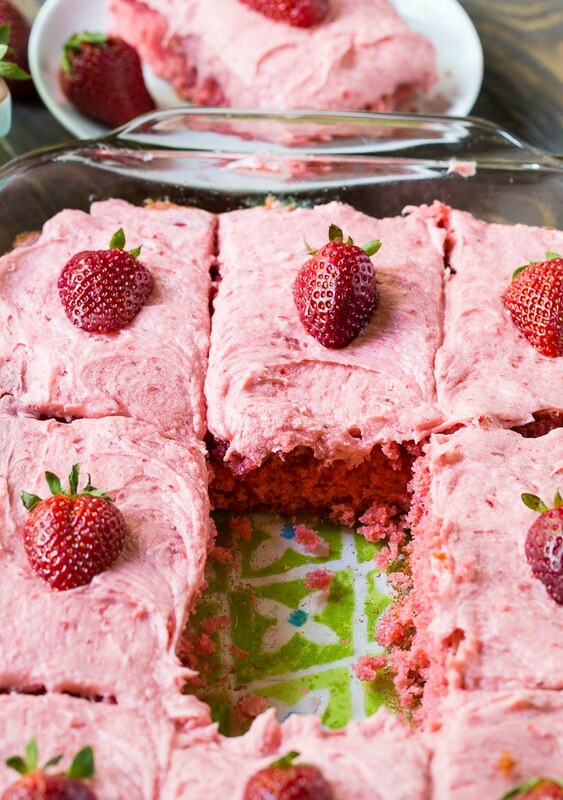 If you had leftover strawberries from making the cake batter, you can combine them. Place strawberry puree in a small saucepan and bring to a simmer. Cook, stirring occasionally until thickened. You should have about 1/3 a cup. Let cool completely. Use an electric mixer to beat butter until creamy. Beat in 1 cup of sugar and then half of the 1/3 cup of reduced strawberry puree. Beat in another cup of confectioners' sugar and remaining puree. Beat in final cup of confectioners' sugar. Spread frosting on cooled cake. This entry was posted in Cakes, Desserts and tagged spring desserts, strawberries. Bookmark the permalink. I thought this cake was absolutely perfect! Delicious with lots of strawberry flavor. Made the cake as directed but added an extra cup of confectioners sugar to the frosting as the icing was a little too buttery for me. But after all it is Butter Cream Frosting! Could add a 4 oz block of softened cream cheese also. The 2 cups strawberry purée reduced just fine for me, simmered for about 45 minutes, but yielded 1/2 C instead of 1/3, cooled in freezer, frosting consistency was perfect. Very good and will make it again! Thanks for leaving your feedback and tips Deb. They are very helpful! I have made many strawberry cakes. I thought I would try a new recipe. The worst cake I have ever made. The icing was absolutely terrible, way to much butter not smooth at all. The worst thing is it was for my son’s birthday I will go back to my original receipt. I made this and the icing just tasted like butter. Stopping by to thank you for sharing this beautiful cake with all of us at Weekend Potluck! Thanks for ALL your delicious shares at WPL. 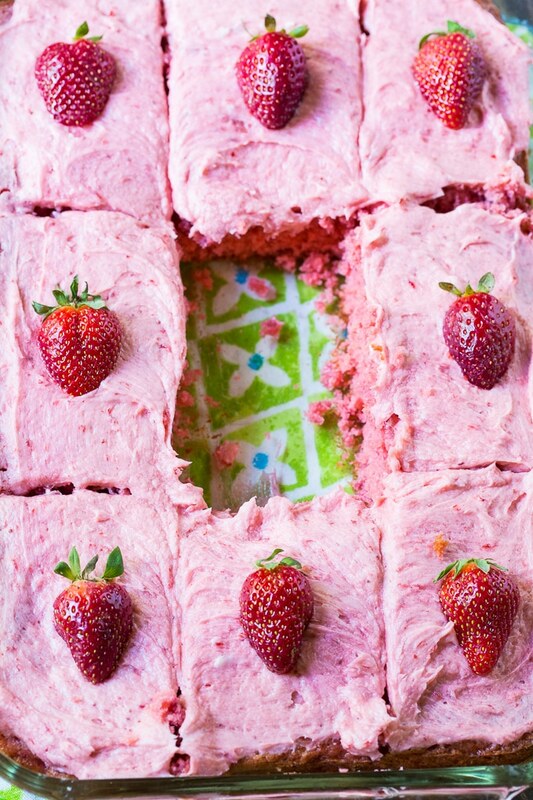 Your Strawberry Sheet Cake recipe is featured today at Weekend! I hope you have a great Memorial Day weekend! Been making this recipe for years but in our version we add shredded coconut & chopped pecans to both cake and frosting. Also have made frosting Cream Cheese Strawberry with coconuts and pecans…you should try. This looks delicious! I am going to try to make it with a from scratch cake recipe. I am allergic to some of the ingredients in cake mixes.. 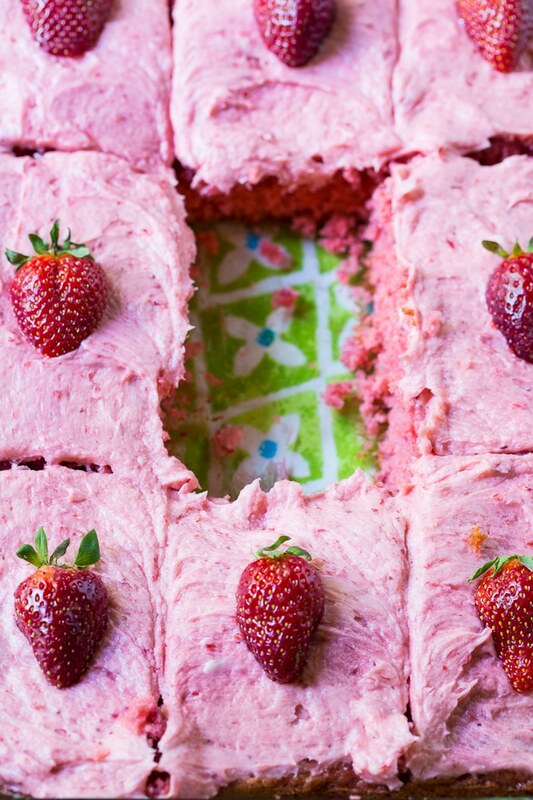 This cake is absolutely dreamy, moist and full of strawberry yumminess. However, I did the recipe just like it said, but my frosting was never thick. I ended up putting it in the freezer. Could you please tell me what I may have done wrong or how I could fix this. How soft was your butter? Maybe let the butter sit out for less time and make sure the strawberry puree really reduces and thickens up and be sure not to use any more than 1/3 a cup. Would this icing recipe work with less butter? I’ve made this family favorite for many years- my frosting never quite thickens either to spreading consistency (I don’t puree then simmer as called for in this great recipe, I rough chop the strawberries for the frosting and the cake, too- the mixer does the rest of the work for me), I just leave the cake in the pan and pour/ spread the frosting on the cake. My folks like the small chunks of strawberry in the cake and frosting. Hubby has already requested this cake for his birthday in a few weeks. Happy Baking, y’all! !